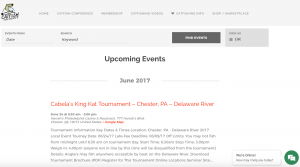 In its ongoing efforts to support the growth of the sport of catfishing, the Catfish Conference is offering tournament organizers to list their event on our tournament calendar. With thousands of visitors every month, www.catfishconference.com is the ideal place to list your catfish event / catfishing tournament. 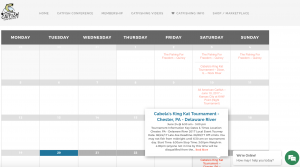 We have a well designed calendar that will provide useful information to interested visitors on your organization, your event/tournament, and details about what you do best. Listing your catfishing tournament with us is a free service if you meet conditions listed here below. You must send us quality pictures before and after the event. The Catfish Conference Team reserves the right to refuse to list any tournaments/events at our own discretion without having to disclose any reasons that may have lead to a refusal. We thank you for all the time and efforts you are putting in your event!